PRAISE THE LORD, my precious brothers and sisters in our Lord Jesus Christ! I hope this finds you all well and being blessed! We in the Rowe Tribe are all well and blessed! WE HAVE EXPERIENCED SOME CHALLENGES on this journey, but the challenges are there to refine us, and keep us looking to Jesus, the Author and Finisher of our faith. ONE OF THE CHALLENGES we have had is in the way of our computer situation. MY PERSONAL LAPTOP COMPUTER that I use to write these newsletters and for the updates on my website, as well as my e-mail ministry has finally gone the way of all computers - it decided to “byte” the dust! BUT...the good news is that I didn’t lose a lot of my information I had stored up on the computer. I was able to recover most of it from my hard drive. I lost about 30 pages of my journal, and a bunch of pictures I have taken on this prayer walk...But...I have most of it, any way. SOOO...ALTHOUGH THE LAPTOP DIED, we have other computers I am able to use to get this newsletter printed and sent out. Anyway, this may be a little briefer than most, because of these complications. THE MAIN THING I WANT TO ACCOMPLISH in this newsletter, is to wish all of you a wonderful Jesus Christ filled Christmas, and a New Year that is truly Spirit led. WE WANTED TO SEND you a current photo of our family as a Christmas card...Abigail is getting big...but we couldn’t get that together in time, either. Maybe next time I send a newsletter, I will have worked out all the glitches, and will be able to get a picture to you. 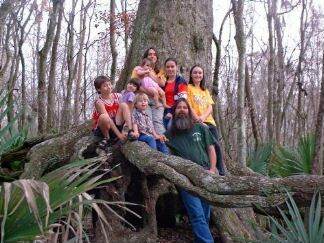 Michelle snapped an impromptu photo of the children on our digital camera, which we will put in the back page of this newsletter. DESPITE THE LITTLE SETBACKS, this prayer walk has been a wonderful blessing. I was driving my car down town one day, to prayer walk through the streets of the French Quarter, when I felt the Lord was directing me to walk AROUND the Quarter, instead of through it. In obedience to the prompting of the Holy Spirit, I proceeded to carry my cross around the French Quarter, starting at the corner of Rampart and Esplanade. FOR THE NEXT FIVE DAYS I walked around the French Quarter once, praying all the way. On the seventh day of walking, I had a small army of Christians join me for the Grand Finale, 7 times around. One time around is about 4 miles. We started at 12:00 midnight to beat the heat. By the time we finished, we were taking LONG breaks between rounds. We ended up taking 24 hours to complete the march...but each time around, God showed us some wonderful things that He was doing. We got to minister to some people, and I really believe that some spiritual ground was taken on that march. I DON’T HAVE MY JOURNAL ACCOUNT of that march, or more pictures, so I can’t give you an accurate account of all that happened. BUT...It was an awesome blessing to do it, and to have my brothers and sisters in Christ join me. I BELIEVE WE MARCHED the march from 12:00 a.m. Thursday morning to sometime after 12:00 Friday morning. Friday night a group of 25-50 Christians from the Celebration Church Youth group came out to Bourbon Street and we had a praise and worship celebration in the midst of the sin. GLORY! It was wonderful. People were very receptive to the Word. I believe that part of what the Jericho march accomplished was to cause people to be more receptive to the Gospel as the laborers go out and share the Love of God to the lost. 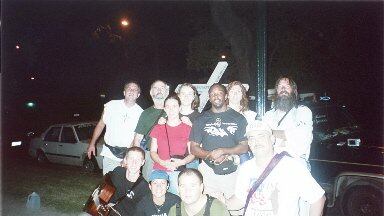 I KNOW THAT I HAVE HAD some real Wonderful times of ministry out there whenever I have gone to Bourbon Street since then. I will be interested to see the Wonderful fruit we will have during Mardi Gras. During the annual “Southern Decadence” festival, a party where homosexuals flaunt their sexual sin, we had some wonderful ministry opportunities, with very few hostilities aimed at us. I believe the Jericho walk was part of that. I HAD ALMOST GOTTEN ARRESTED on a previous night for having my cross on Bourbon street (the officers said it was a hazard to the people if it happened to fall), so we made some Jesus banners out of a couple of signs from the signs that Dr. Demitri Cossich, my dentist friend from Buris, La. had given me to plant along the river on my journey North. The signs were as good as the cross in their drawing power for the people. We stayed busy all night ministering to lost souls. THE FOLLOWING WEDNESDAY, the Lord spoke to my heart to have Michelle make a cloth “Jesus” Banner. We went to Wal-Mart and got enough material to make two of them. The material we got was black cloth representing sin, with the word Jesus made out of a shiny silver material, and the letters bordered by red sequins, to represent the Blood of Jesus Christ that was shed for us. At first I thought the black cloth didn’t have too good of a price on it... $6.66! Then I realized it was a Perfect Price, since the cloth was to represent sin! 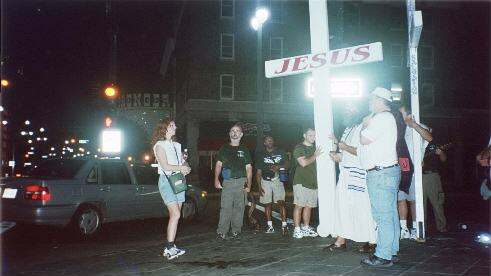 WHEN WE TOOK THE BANNER out on Bourbon Street, many people would just stop and stare at it...I remember one man stopping, patting me on the shoulder, and saying, “Man, there’s just something about that Name, isn’t there?” He wasn’t even saved, but he realized the significance of the Name of Jesus. The banner stands 14 feet above the crowd. Glorious Jesus! Another wonderful tool for the ministry! FROM CELEBRATION CHURCH, we moved to Westwego, and parked at New Life Family Church, pastor Dan Dixon. We were blessed to stay there a while as I covered some ground on the West Bank. PLEASE PRAY FOR PASTOR DAN AND HIS MINISTRY AND HIS FAMILY, THAT THE LORD WOULD BLESS THEM AS THEY SERVE THE LORD. PASTOR DAN HAS A HEART FOR THE THINGS OF GOD, AND FOR OUTREACH. THEN WE MOVED TO AVONDALE, to the Lighthouse Christian fellowship, pastor Emmet. Again, we were blessed by their hospitality, and ended up driving North to get out of the way of Hurricane Lili’s path. We parked our bus in LaPlace at Pastor Niel Bernard’s church, New Wine, and drove our motor home to Taledega, Alabama, to minister at the Taledega 500 around the 1st of October. While there, we parked at Pastor Kent Maddox’s church, Word Alive. We got to visit with some fellow evangelists and friends, Terry and Karen House and their children. It just so happened that Mike Siemer and his family came there to pick up a bus that Terry and Karen had given them. So Michael and I got to minister a little at the speedway that Saturday. Sunday is the big day, and the Lord gave me many opportunities to share His Love and Grace to race fans. FROM TALEDEGA we went to New Wine, and spent a few weeks there. They have a ministry where they feed the elderly on a daily basis, and the precious sisters who worked in that capacity blessed us daily with some wonderful meals! PLEASE PRAY FOR PASTOR EMMET, PASTOR NEIL, AND PASTOR KENT MADDOX AND THEIR MINISTRIES, AND THEIR FAMILIES, THAT THE LORD WOULD BLESS THEIR ENDEAVORS TO FURTHER THE KINGDOM OF GOD IN THEIR AREAS. THE NEXT STOP WAS GRAMERCY, and Pastor Sam Jones of the First Baptist Church in Gramercy. We had a wonderful stay there, with brother Sam assuring us almost daily that we didn’t have to be in a hurry to leave. I couldn’t find any place to park on the West side, so I walked both the East side and the West side from Pastor Jones’ church. Every day I was blessed with wonderful opportunities to sow into people’s lives. I WOULD LIKE TO SHARE ONE TESTIMONY IN PARTICULAR. I was walking on the levee through Convent, LA, when a couple of ladies came and walked with me. One of the ladies was a teacher, and she told me that she had something to tell me that would bless me. She said she had a friend who is also a teacher, and she teaches special ed, dealing with mildly to severely mentally handicapped children. One of the children she deals with is autistic. She said she knew the child speaks, but the teacher never heard the child speak in the 3-5 years that she had dealt with the child (facts are sketchy because I lost this portion of the journal as well). One day this teacher was driving the autistic child home, when all of a sudden, the child blurted out, “IT’S TRUE! IT’S TRUE!” The teacher was shocked to hear the child speak, and said, “What’s true, _____?” (Again, I forgot the child’s name. The child excitedly replied, “THERE IS A MAN ON THE LEVEE, DRESSED LIKE JESUS, AND CARRYING THE CROSS!” That testimony was a wonderful blessing to me! I ALWAYS HEAR OF THINGS that have happened without my knowing it, but this was a wonderful inspiration to me. PLEASE PRAY FOR BROTHER SAM JONES AND HIS LOVELY HELPMEET, SISTER BETTY. THEY HAVE BEEN IN THE MINISTRY FOR 60-SOME-ODD YEARS, AND THE PAST COUPLE OF YEARS HAVE BEEN A PHYSICAL CHALLENGE TO HIM AND HIS WIFE. BUT HE IS A WONDERFUL PREACHER! I WAS ALWAYS BLESSED TO HEAR HIM PREACH, AND ALSO SOME WONDERFUL NUGGETS OF WISDOM HE SHARED WITH ME. I PRAYED THAT THE LORD WOULD GIVE HIM AT LEAST ANOTHER 20 WONDERFUL YEARS OF MINISTRY. ALSO, PLEASE PRAY FOR BROTHER BILL, THE SUNDAY SCHOOL DIRECTOR, THAT THE LORD WOULD GIVE HIM WISDOM AS HE SERVES THE LORD. BROTHER BILL IS A NEW CHRISTIAN, BUT HAS A ZEAL TO SERVE THE LORD AS MUCH AS HE CAN. AT THE TIME OF THIS WRITING, we are in Sorrento, La. We are parked at New River Baptist Church, and the pastor, Mark Flurry resigned the week we came here. This church needs a pastor. In it’s 156 years of existence, the longest a pastor has ever stayed here has been 6 years. PLEASE PRAY THAT THE SHEEP AT THIS CHURCH WILL FIND A SHEPHERD WHO WILL STAY AND GUIDE THEM IN THE WAY THEY SHOULD GO. PASTOR MARK JUST FELT THE LORD WAS LEADING HIM IN A NEW DIRECTION, SO PLEASE PRAY THAT THE LORD WOULD BLESS HIM AND HIS FAMILY WITH KNOWING HIS PERFECT WILL FOR HIS LIFE AND HIS MINISTRY. AND PLEASE PRAY FOR US, THAT WE WOULD CONTINUE TO PERSEVERE IN THE THINGS OF THE LORD, AND THAT MANY MORE SOULS WOULD COME TO A SAVING KNOWLEDGE OF OUR LORD JESUS CHRIST, AND PRAY FOR THE CHURCH IN AMERICA, THAT SHE WOULD BE THE BRIDE JESUS IS COMING BACK FOR, PURE AND SPOTLESS. LET’S GET SERIOUS AND RESOLVE TO BLESS OUR LORD AND SAVIOUR, JESUS CHRIST THIS YEAR! MORE AND MORE as I carry this cross and pray, I see the great lack in the Christian church in America. The lack of commitment to the Lord and the things of God. The fact that with a few exceptions, there are either “Black Churches”, or “White Churches”, and great division in the body over issues of race, or social standing, or economic status. WE ARE SO LOUD in the building on Sunday and Wednesday, but the rest of the week, we fail to be the church to the lost, and to our hurting brothers and sisters. I HAVE VISITED MANY churches where those in ministry prefer titles. I’ve met them all. “Bishop That’smyname”, or “Deacon Runtheshow” or “Pastor Lorditall”, or “Evangelist Tellthemoff” or “Prophet Buymyanointing” or “Reverend Onemanshow”. Too many of those who are in leadership position may say they want to Glorify the Lord, but it’s their names that they are lifting up. Oh, my Lord, it is so prevalent in America! THE LAITY ISN’T MUCH BETTER. “Brother and Sister Holierthanthou” spend their time gossiping, backbiting, judging, condemning, and acting holier than thou in the building, but forgetting what they are supposed to be outside the church, SALT AND LIGHT. Full Gospel, Baptist, Pentecostal, Charismatic, Methodist, Presbyterian, you name it...all talk about having a personal relationship with Jesus, and yet by their very works, they deny Him. We have moved so far away from the Truth in America. We need to get real with the Lord and with each other. I am not writing this to condemn anyone. I’VE GOT MY OWN FAULTS I NEED TO WORK ON!